Annan welcomed Clyde to Galabank on Saturday for what was Danny Lennon’s first league game in charge since being presented with the reins following the sacking of ex Annan boss Jim Chapman. 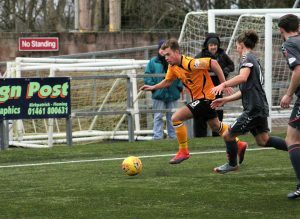 It was a game Annan will look back on with some regret after Aiden Smith squandered a glorious opportunity when he blasted a penalty over the bar in the 62nd minute. There was not a lot between the sides with goal scoring opportunities at a premium for both teams. Annan boss Peter Murphy has certainly tightened Annan’s defence up but the goals at the other end are few and far between, Annan are becoming a team that are proving very difficult to defeat but if they are to get out of the lower third of the league they must start converting the sequence of draws to victories. The first half came to life in the 25th minute when Clyde created a good opening ending with Smart Osadolar’s low shot producing an important save by Jim Atkinson. Minutes later Blair Henderson was denied by the alert Blair Currie who cut out Moxon’s penetrating through ball. Rabin Omar then sent in a good cross which Orsi managed to get his head to but the effort was easily saved by Blair Currie. Steven Swinglehurst denied David Goodwillie with a superb challenge in the 36th minute as the Clyde striker homed in on goal. As the game approached half time Omar forced a corner which the Clyde defence did well to clear. Both teams started the second half with no changes, Blair Henderson appeared to be booked harshly in the 51st minute for a tackle on Duffie. Jack Brannon was well placed to clear Darren Ramsay’s effort after goalkeeper Jim Atkinson’s attempted punch was misjudged. Moxon then connected with Omar’s cross but the effort sailed over the bar. Annan were starting to become more of a threat but it was Clyde who were presented with a good opportunity in the 59th minute when Jack Brannon fouled Goodwillie on the edge of the box with the Clyde striker looking to home towards the Annan goal, Goodwillie however failed to hit the target and the opportunity was lost. Then came the penalty decision when Blair Henderson’s effort was handled by Martin McNiff leaving the referee with no option but to award Annan a penalty but the normally reliable Aiden Smith skied the spot kick high and over the bar which summed up his afternoon. Annan continued to press forward looking for the vital opening and Peter Watson’s header from a Sinnamon corner in the 81st minute went narrowly over the bar. Annan substitute Ross Ferguson made his debut after the loan signing from Queen of the South came through and he came very close to a dream debut in the 84th minute after his shot from close range struck the post, it was another lucky escape for Clyde. Most of the action was around the Clyde goal and in the dying minute Rabin Omar squandered a chance when he shot past from a promising position. Annan Athletic – Jim Atkinson, Scott Hooper, Jack Brannan, Owen Moxon, Steven Swinglehurst, Dan Orsi (Brandon Luke 86 min), Ryan Sinnamon, Aiden Smith, Blair Henderson (Ross Ferguson 78 min), Scott Roberts ( Rabin Omar 70 min) Substitutes not used Alex Mitchell (gk), Ayrton Sonkar, Brandon Luke, Shaun Bell, James Creaney, Peter Murphy . Clyde – Blair Currie, Callum Home, Jodan Stewart, Martin McNiff, Andrew Munro, Keiran Duffie, Barry Cuddihy, Darren Ramsay, Smart Osadolor (David Gormley 70 min), David Goodwillie, Jordan Loudan (Jack Breslin 89 min). Subs not used Max Wright, Mark Lamont, Lewis Wilson, Peter Morrison GK. Referee – Scott Miller Assistants – Ivan Stankovic and Daniel Graves.